Scratch Chocolate Cake made with 2 cups of dark brown sugar. Preheat oven to 350 degrees F. Grease and flour two 9x2 inch round cake pans. In a large mixing bowl, combine the oil, melted butter and brown sugar. Beat with an electric mixer until well blended, then add the eggs one at a time, beating for 30 seconds after each egg is added. Beat in the vanilla. By hand or using lowest speed of the mixer, add the dry ingredients alternately with the buttermilk. Stir until fully blended. Pour the hot coffee over the batter and stir until blended. Pour batter into pans and bake at 350 for 30-35 minutes or until a cake tester comes out clean. Let cool in pans for 10 minutes. Turn from pans and cool. 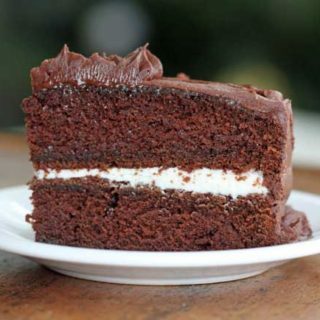 Frosting: Mix together the softened butter, sour cream and confectioners' sugar until blended, then add the cocoa powder and stir until it because a messy mass. Gradually add the half and half (or milk and cream), stirring until blended, then beat in the vanilla. Beat, scraping bowl often, until mixture is smooth and creamy. If you like a lot of frosting, you may want to make 1 1/2 times the recipe. However, if you make the recipe as is and are conservative with the middle layer of frosting, you should have enough.